What Do Survivors of War Have to Do to Live in Peace? 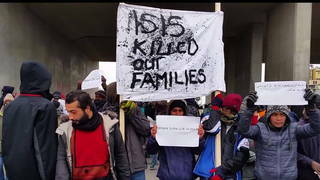 : Voices from France’s Largest Refugee Camp | Democracy Now! Residents of the largest refugee camp in France, situated outside the northern port city of Calais, often call it “The Jungle.” It is a maze of wind-swept, ripped tents and muddy walkways where people informally live in sections according to their home countries. Walking through the camp is like walking through a map of the targets of U.S. bombing campaigns: Iraq, Syria, Sudan and, of course, Afghanistan. By far the largest community in the camp is Afghans who fled the 14-year-old U.S. war in Afghanistan. Democracy Now! visits the Afghan section, where people recount living through the longest war in U.S. history, which President Obama indefinitely extended this past fall. AMY GOODMAN: We’re broadcasting live from COP21, the U.N. climate change summit in Paris, France. But we’re going back now to the Calais refugee camp, which is about two miles north—two hours north by train from Paris. It sits outside the northern port city of Calais. Many in France and residents themselves call the camp “The Jungle.” It’s a maze of wind-swept, ripped tents and muddy walkways, where people informally live in sections according to their home countries. Walking through the camp is like walking through a map of the targets of U.S. and Western bombing campaigns—Iraq, Syria, Sudan and, of course, Afghanistan. By far the largest community in the Calais refugee camp are Afghans who fled the 14-year-old U.S. war in Afghanistan. Nermeen Shaikh, Laura Gottesdiener, Hany Massoud, Denis Moynihan and I spent most of our day on Saturday in the Afghan section of the camp, where people recounted living through the longest war in U.S. history, which President Obama indefinitely extended this past fall. After covering a refugee protest and speaking with Syrian refugee Majd, we visited the first makeshift restaurant established in the camp to meet with its owner. AMY GOODMAN: We’re just back from Majd’s tent, where he lives with two other men. And we’re now on the street of, well, makeshift restaurants. There’s a barbershop. This is the Kabul Café. And right here, as we’re going in, is a map of the whole camp. Let’s go inside. We’ve come to the back of the Kabul Café—it’s very warm here in this back room—to speak with the owner. Can you tell us your name? SIKANDAR: Yeah. My name is Sikandar. AMY GOODMAN: And can you talk to us about when you got to this camp? SIKANDAR: Yeah. It’s about more than six months. AMY GOODMAN: And where did you come from? AMY GOODMAN: Where in Afghanistan? SIKANDAR: Nuristan, but I grew up in Kabul. Yeah. AMY GOODMAN: And why did you leave Afghanistan? SIKANDAR: Because of war. Because of Americans’ politics. Because of the England politics. Because they come to my country, use the bombs, the weapons. In my country, we don’t have any weapons. So these weapons is using in Afghanistan, if the terrorists using, if the Americans using, if anyone using, just use it in my country. So, there is war in my country, and I am here. AMY GOODMAN: We just saw a protest about a death of a young man named Joseph, a Sudanese man who was killed on the highway, on the overpass above. Do you know about that? SIKANDAR: Yeah, I know. Yeah. SIKANDAR: It’s happened every day. It’s not just this one time, you know? It’s happened every day, every week. And one month before—in one month, nine people died here in Calais. AMY GOODMAN: Why are you willing to risk all of this? SIKANDAR: Because if the people like me, they have problems in their countries, like me. If I have a problem in my country, I have to go forward, you know? I don’t have to go back. If I go back, I’m—100 percent, I die. But for this, I can risk. I say, OK, maybe 50 percent, I go. So some people—I think people are thinking like this: If I go back, I will die, and I have a very bad life. It’s better to try, 50 percent—maybe I will go there and I will arrive there, and I will have a normal life. AMY GOODMAN: President Obama said the war is ending in Afghanistan. Do you see it ending? SIKANDAR: Until Americans in Afghanistan, it will be not ending. Never. AMY GOODMAN: The map of this camp, it’s like a map of the world, or a part of the world. AMY GOODMAN: It’s a map of where refugees are from. Most of these countries have been bombed by the United States. SIKANDAR: I really didn’t think about it. The map of The Jungle is looking like the map of the world. AMY GOODMAN: Syria, Afghanistan, Iraq, Sudan. SIKANDAR: Yeah, yeah. Yeah, yeah, yeah. It’s true. I didn’t think about it, but, yeah, it’s true. AMY GOODMAN: We’re walking through the refugee camp, just outside of Calais. As we walk, some people just pass us, some people stop and look. And occasionally people stop to talk. But we’ve been warned over and over that people don’t want their faces shown. They’re afraid. They’re afraid of being targeted here, and they’re afraid their families will be targeted at home. It’s very cold and overcast. It’s just rained, so it’s very muddy. And it looks like it’s going to be raining again. Do you want to say your name? SIDIQ HUSAIN KHIL: My name is Sidiq Husain Khil, and I am from Afghanistan. AMY GOODMAN: When did you come here? SIDIQ HUSAIN KHIL: I am here since four-and-a-half months. AMY GOODMAN: And why did you come here? SIDIQ HUSAIN KHIL: I want to go to U.K., because in Afghanistan, you better know, the situation are very bad. And America comes there. They want to finish al-Qaeda and terrorism, but they are unsuccessful in that. Instead of that, to finish the terrorism, they increased the war in Afghanistan. And the people are in a very bad situation. It’s all because of America. AMY GOODMAN: Where do you come from in Afghanistan? SIDIQ HUSAIN KHIL: I come from Kunar. AMY GOODMAN: What is it like? Was it destroyed? Was it bombed? SIDIQ HUSAIN KHIL: Yeah, Kunar was totally destroyed. And a big group of Americans were there. There was a big base. And still, Kunar is under bombing, from—even from Pakistani side. All areas of Kunar is. Each day and every day, the Pakistan is bombing on Kunar. And at that time, was also American were bombing there, because from the past the people of Kunar are all like—you know, they are religious people, all of them, like that are the—this is the main center of Taliban. AMY GOODMAN: Why do you think they’re bombing? SIDIQ HUSAIN KHIL: Because they say these people are Taliban, they are terrorists, Americans are bombing there. And Pakistan is also bombing there. Pakistan think that the Taliban are hiding here. And they were thinking that Osama is also there and the Hezb-e Islami leader, Gulbuddin Hekmatyar, is also there. That’s why Kunar is mostly under attack. AMY GOODMAN: Were there drone strikes in Kunar? SIDIQ HUSAIN KHIL: Yes, there were drone attacks. AMY GOODMAN: And what effect do they have? Did you know people killed? SIDIQ HUSAIN KHIL: They’re always killing innocent people. They’re bombing on the civilians, on the villages. In fact, they were not Taliban. Many times they kill civilians there. AMY GOODMAN: And how does that make people feel? SIDIQ HUSAIN KHIL: They make people unhappy, disappointed, from both sides—from government and from the—from the whole world, from America, from all the people. AMY GOODMAN: Al-Qaeda, Daesh, do you think it increased since 2001? SIDIQ HUSAIN KHIL: Since 2001, yeah, because, you know, if they are bombing on civilians—America or the NATO or all these groups—if they are bombing on civilians, civilians become very angry, and they join the group of Taliban. That’s why if they are killing one person or 10 person, 100 of them are joining the group of Taliban. They don’t support the government, because government cannot help them. AMY GOODMAN: So are you saying the bombing increased terrorism? SIDIQ HUSAIN KHIL: Yes. The war is not the solution for finishing terrorism. They have to talk face by face. What is their demand, you know? Look to the Syria. The whole world is bombing Daesh, but they are increasing. They can’t do anything. AMY GOODMAN: When did you actually leave Afghanistan? SIDIQ HUSAIN KHIL: I left Afghanistan in—I think in August. I don’t know. Five, six months ago. AMY GOODMAN: And how did you make your way out? SIDIQ HUSAIN KHIL: It’s a big story. It’s very difficult. You know, everyone knows. I come to Iran. Then, after that, I come to Turkey. After that, I come to Bulgaria. SIDIQ HUSAIN KHIL: We—sometimes we were in buses, sometimes we were walking, in the mountains when we were crossing the borders. AMY GOODMAN: So, from Bulgaria to where? SIDIQ HUSAIN KHIL: From Bulgaria to Serbistan. SIDIQ HUSAIN KHIL: To Serbia. SIDIQ HUSAIN KHIL: Then to Hungary. SIDIQ HUSAIN KHIL: Then to Austria. SIDIQ HUSAIN KHIL: And then, you know, to Italia, France. And now I’m here. AMY GOODMAN: It’s a very, very long trip. SIDIQ HUSAIN KHIL: It’s a—yeah, of course, it’s a very long trip. It’s not that easy just to buy the ticket of airplane and go to the airport, sit in the plane and come directly here. We were just illegally crossing the borders, and that is very difficult, a very difficult task. We lost many of our friends. They lost their—they passed away, they lost their lives. And some of the people, they’re not with us now. NERMEEN SHAIKH: And your family? Is your family with you here? SIDIQ HUSAIN KHIL: No, my family is not here. AMY GOODMAN: Where is your family? SIDIQ HUSAIN KHIL: They’re in Afghanistan. Yes. NERMEEN SHAIKH: So, what do you think the U.S. should be doing now? SIDIQ HUSAIN KHIL: I told you, you know, U.S. is just increasing the war. Actually, U.S. don’t want to finish the war. It’s their game. It’s the game of George W. Bush, Obama and all the European Union. They don’t want to finish that. SIDIQ HUSAIN KHIL: Because it’s on the—behind, there are their profits, their benefits. They are selling their weapons and using in the Islamic countries. This is the big point. How much they spend there? If they spend $100, they’re getting from there $1,000. They don’t care about the people who are dying there. AMY GOODMAN: President Obama said they’re wrapping up the war in Afghanistan. Do you feel like the U.S. is ending the war in Afghanistan? SIDIQ HUSAIN KHIL: What do you mean, sorry, by “wrapping”? AMY GOODMAN: Ending the war. SIDIQ HUSAIN KHIL: Ending. No, never he will end the war. Never he will end the war. AMY GOODMAN: Can you be safe in Afghanistan? SIDIQ HUSAIN KHIL: I don’t think so. If I was safe there, I don’t like to live here in these tents. And I don’t like these, the high buildings, the beautiful countries. My country is my country. But, you know, I was not safe there. AMY GOODMAN: Did things change here after the November 13th attacks in Paris? SIDIQ HUSAIN KHIL: Yes. But, you know, it’s—everywhere, the police are checking. The security is very strong. And, yes, it’s totally changed nowadays. Before, it was good. The border was also good. Nowadays, it’s very strong security. AMY GOODMAN: Did they come here after the attacks? SIDIQ HUSAIN KHIL: Yes. Each night, they are coming here. AMY GOODMAN: So even though the U.K. and the United States bombed your country, you would like to go live there? SIDIQ HUSAIN KHIL: Yes, both are the same for us. America, U.K., France—all the European countries are the same for us, because they are bombing our countries and they destroyed our countries. But their countries are OK and good. AMY GOODMAN: We then went to another area, where there were, well, sort of small campers that people had donated for families. We met a woman who had been a teacher in Kabul, Afghanistan, before she fled with her four children. She and her 12-year-old daughter described their journey. DUR: We had to travel by bus, by car, by horse, by train, until here, by boat, all. AMY GOODMAN: Can you tell me how you got from Afghanistan to France? DUR: From—I will let my daughter tell you. AMY GOODMAN: So, how did you get from Afghanistan here to Calais? AMY GOODMAN: You took a boat? AMY GOODMAN: Was that scary? DUR: Yeah, all of us scared from the boat. At first, when I saw that boat, I don’t know about this boat. When I saw that they—after that, they said, “You come.” I called all my children and told my [inaudible], and I start to cry. Oh, I bought death by money. I spent all my money to buy them death, for all of you. Yeah. DUR: To buy the death. AMY GOODMAN: To buy death for all of you. DUR: For all of you. And I start crying. AMY GOODMAN: And you made it. And then where did you land? AMY GOODMAN: In Greece. And then, where did you go from Greece? DUR’S DAUGHTER: Then we went to Macedonia, Serbia. DUR’S DAUGHTER: Ah, Hungary, then Autriche. AMY GOODMAN: Oh, Hungary, then Austria. AMY GOODMAN: This is quite a geography lesson that you lived. That was Dur and her 12-year-old daughter. After we left their camper, just as we were heading out of the camp, a young man ran after us. He said he wanted to tell us his story. NAJIBULLAH: It was 2011, yeah. AMY GOODMAN: What were you doing? NAJIBULLAH: I was interpreter with the U.S. Marines, yeah. And we were in a FOP, forward operation base. And then, yeah. AMY GOODMAN: And how long did you work? NAJIBULLAH: I was working with them seven years—seven months, yeah. AMY GOODMAN: And then, also for a U.S. contractor? NAJIBULLAH: And before that, yeah, I was also working in a construction company, in Creative International company. They were running a project by the name of Crowded House. That project was from the DOD side for—they were creating culverts, bridges and retaining walls for the people of Daykundi province, yeah. AMY GOODMAN: And so, did you apply for immigration to the United States? AMY GOODMAN: Sort of on letterhead from Creative International. NAJIBULLAH: Yeah. So they said—but that letter which I had, that was from the—from those people who was working with us from the DOD side. And those numbers and emails were just, you know, local from Afghanistan. And by the—from the day they left Afghanistan, those numbers—emails doesn’t work. And what I am trying to say, that working with the U.S. government, it doesn’t matter; you work just one day or a year or two years or for four years, it doesn’t matter to the Taliban. As long as you work with them just one hour, you’re condemned to death. So, that’s what happened to me. I was condemned to death. And I am asking the U.S. government why they refuse me to give me a visa. And that’s why I’m here. That’s why I am here, I’m facing this difficulty. AMY GOODMAN: Just a few of the thousands of Afghans now stranded in the Calais refugee camp, risking their lives to reach Britain. Double and, in some places, triple rows of barbed wire fences were built recently, securing both the entrance to the Chunnel—that’s the Channel Tunnel—and the tractor-trailer staging area for trucks bound for the U.K. All trucks entering the tunnel are also subjected to infrared scanning, looking for body heat, for stowaways. Just months ago, it was common for scores of people to transit the tunnel nightly, hidden in trucks or on the high-speed train. Now it’s almost impossible. It’s 14 years into the U.S. war in Afghanistan. President Obama had pledged to withdraw the majority of the thousands of U.S. troops deployed to Afghanistan by the end of 2015. But in October, he reversed course and, instead, indefinitely extended the longest war in U.S. history. There are nearly 60 million people forcibly displaced worldwide, the largest number since World War II. Special thanks to Democracy Now! 's Laura Gottesdiener, Nermeen Shaikh, Hany Massoud and Denis Moynihan. We're in France. Back in a moment. AMY GOODMAN: “Borders” by M.I.A. She directed the video, featuring refugees, showing them on their hazardous journey to Europe. This is Democracy Now!, democracynow.org, The War and Peace Report. I’m Amy Goodman.